CTC Analytics Leap IFC PAL Liquid Handler Autosampler Dual Head Preparative . New Life Scientific, Inc.
Includes 90-Day Warranty. Confirmed Functional. This CTC Analytics IFC PAL system is in good working condition and ready to be configured for operation. This system is tested to be functional, only requiring software, racks, trays, and slider assembly follower pin prior to application. 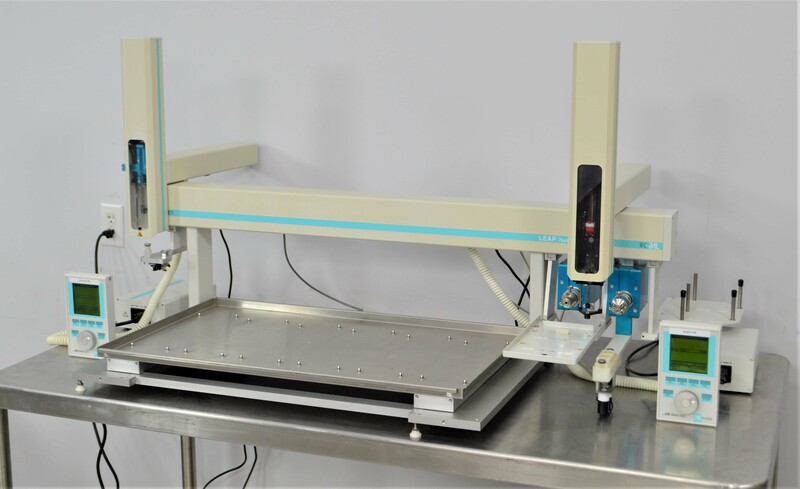 This CTC Integrated Fraction Collector (IFC) is an autosampler and fraction collector, configured in the preparative version with dual head injectors. This system has minor cosmetic blemishes and a cracked protective shield on one of the injector heads. Although this IFC PAL system is incomplete, it is in great physical condition, requiring some accessories to be purchased separately before it is ready for operation. Our in-house technician inspected and tested this CTC Analytics IFC PAL system, confirming it to be in good working condition. The control pendants were used to move the injector heads and perform functions in a simulated cycle. The sliding assembly will need a follower pin before it can be used.